I’m PRETTY SURE they allowed the fire to die down first. Mostly sure. Kind of sure. I failed Headroom 101 and had to tweak dialogue. Some of it was mildly longer. Oh wow, I’ve never met a kid who understood the cinder part, let alone many adults. Clever kid. Also Todd totally should have stated they occassionnally will make you shovel horse crap though. Haha! As a kid, my Cinderella book explained why her name was Cinderella! Yeah, they made her sleep there because it made her dirtier, but hey! Bricks hold residual warmth a loooonnng time. Would have been cosy, if you didn’t have a blanket. As kids my sisters and I used to devour fairy tale books (we had plans to write and illustrate our own someday) and in my experience usually only the older books explain where Cinderella got her name, the kind of books that have like thirty stories in them and only maybe a quarter of them are ‘common’ ones that you see in things like Disney movies. Makes me think that maybe there are some older, hand-me-down type books at the orphanage and that’s actually kind of neat to me because those books always had ‘rare’ stories in them. Those were the gold mines, you know? If it’s the one I read, I.E. what is thought of as the original, I pray not. Girl will be afraid of sleeping where a prince might find her. Well now I’m just intrigued. You get kids here, so I’m loathe to describe it. Let’s just say, the prince saw what looked like a corpse and decided that dead body looks pretty hot. Are we still talking about Cinderella or Snow White? Corpse was Sleeping Beauty. I liked that one, wasn’t her m-i-l an ogress too? Which could explain some of his issues with reality checks. The way I heard it, even childbirth didn’t wake her up. She didn’t wake up until one of the children sucked on her finger, pulling out the enchanted needle. You might consider necrophilic canola-minus-the-seed to be the worst part of that story… but the ogre MIL also wanted to kill and eat the kids. As ogres are wont to do. You know, I’m actually thinking Selkie might enjoy this tale. Some kids have a taste for the gruesome stuff, and the horrific ramifications don’t kick in till you’re older. Plus, as C. S. Lewis put it (roughly), kids already know that monsters exist — nobody needs to tell them that, they don’t get it from books. They need good books (not just factual books) to show them that monsters can be beaten, and to give them behavior models so they feel less hopeless in the face of things they’re afraid of. Silly buggers couldn’t see past the a** and see the Lion. Probably still stuck in the leaky shack with moldy straw. And cold Tea in a cracked cup, an’ all, without cream … or sugar. I never forgave him for doing that to the dwarves. I didn’t understand it till I got into politics. Now I see it everywhere, politicos TRUMPeting it from the podium. Bettelheim had it right. Hey, does Bettelheim translate to Orphanage? In one of the full versions I’ve read, the longest one, the Prince’s mother is an ogress (I’m still not sure if this was meant literally or not) who resents her daughter-in-law and the two children that she gives the prince, who are basically beautiful and perfect and loved by all, so she goes Snow White’s Mama on them (To explain that one, in the original Snow White story there WAS no step-mother, it was her own mother who got jealous) and orders all three of them killed so she can eat them. Well, in the end they’re spared and the Mother-in-Law ends up shoved into… I believe it was a pit full of snakes and that’s the end of her, and everyone lives happily after ever. It was QUITE a shock for my sisters and I finding THAT one in am antique book! I wonder how Selkie will like having to share a room with Amanda again? Todd lives in a two bedroom apartment. Since Amanda is his kid – and everyone seems be in agreement that Amanda IS his kid – then, like with divorced parents, Daddy will get visitation rights. Amanda spend a weekend a month with him, or something like that. And since there is just his room and Selkie’s, Amanda will have to go in Selkie’s room. Now, if he really wanted to disrupt everything, he could conceivably try getting some form of custody through the legal system, but given all the craziness that just got stirred up, and the fact that he experienced “the system” firsthand, he probably won’t go to those lengths to add to the chaos & uncertainty of Amanda’s new-old life. Well, this sets up an interesting legal question which I admit I’m not enough of a legal expert to answer. When Andi put Amanda up for adoption, Todd’s parental rights got terminated without his knowledge or consent; in other words, under false pretenses. (It’d be interesting to see what the original birth certificate says about Amanda’s father.) Todd could argue that he should have his parental rights restored. Having said that, I do hope they settle things without bringing in the lawyers; I know of too many seemingly-amicable separations that degenerated into bickering and fighting once the lawyers got involved. 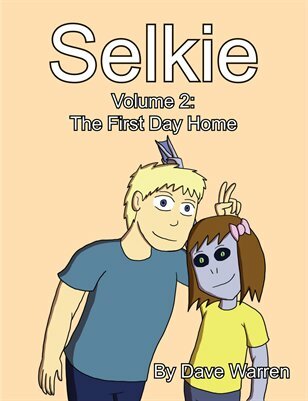 Without Todd’s parental rights restored there would be no sibling relationship between Selkie and Amanda. I believe the story operates on the assumption that they have already been restored. What, why? He literally only just learned he’s alive. Family relatoinships in people’s heads have nothing to do with official paternity rights or whatever. I’m under the impression they aren’t going to do anything official about it, Andi’ll remain Amanda’s legal single parent, and unless it comes up that they need it for something specifically, Todd&co will not do any document thing at all. My brother lived with his girlfriend for a while; she had three kids and they had a fourth one together before they broke up. I got to know those kids through babysitting, and they have a biological link to me so weak that the court system considers it nonexistent (which is reasonable, as much as it annoys me to say that): My brother’s son’s mother’s kids, or my nephew’s half-siblings. We have spent the better part of the past decade-and-some struggling to maintain family ties through what I term “The Foster-Care Nightmare” (due to their mom being on drugs and losing them for a while). Now they’re back with their mom, finally, and we can sort of breathe a sigh of relief. And our support through the years has created some close ties between me and the kids, and between my mom and the kids. I don’t know how much their mom did behind-the-scenes, but near as I can tell, we put more effort (and resources, such as gas money) into keeping them than their *mom* did. And it hurt to have so many people telling us we didn’t have legal rights, didn’t have biological ties, didn’t have any reason to care about those kids or want to spend time with them. And it was super weird to hear some of them talk as though the difference between putting effort in, and letting the kids go, was entirely whether they had a biological tie to us or not. As if, had they actually been my brother’s kids, our behavior would’ve been understandable, but not when they’re not. Ties between family and loved ones have NOTHING to do with biology or legal fictions about who owns what relationship. Those are my nephews and my niece and I am thrilled to have kept up the relationship enough to see them almost to adulthood, and to be assured of a continued relationship once they’re able to make decisions for themselves. I’m glad to hear that you did this. I agree. This is a good thing that you did, and I’m glad that you were able to maintain this relationship. Without him being married to Andi, and also not being present when the birth certificate was being made, he pretty much had no parental rights, legally. (Unless Andi had listed his name, and I’m not sure what the state laws are for “unmarried; mother claims X is the father” in whatever era we’re talking.) But yes, he can get a paternity test, which can grant those rights, and it doesn’t have to be done in a hostile fashion (I know someone who had to do that for various reasons that, I think, included a lost-or-unfiled-with-the-different-state birth certificate). Todd won’t need specific visitation rights, Andi will let him see her as often as possible. Besides, Amanda probably won’t want to stay overnight for quite sometime, given the mutual dislike between the girls and how unsure she is of Todd. Who knows, Todd might even move into a bigger place and set up Amanda a bedroom to make her truly feel like she belongs and isn’t just a visitor or a guest. Do you make Amanda’s pigtails do the “emotional ear” thing from My Little Pony on purpose? Cause it sure looks like that happens a lot. WARNING: Clicking on these links can cost you hours of your life. I still think of them as “Azumanga Daioh hair”. Yeah, the emotive pigtails are intended. Selkie’s hair emotes a little too, but it’s less noticeable and frequent. By the way, I can’t quite recall how/if Amanda reacted to Todd being adopted as well? Selkie was quite (pleasantly) surprised when she found out back in the days. Looks like Selkie’s over her discomfort at Amanda being in the same room and back in fine snarking teasing forms. Yeah, I’m also really appreciating that about this comic. Not only is she snarking, but the fact that she’s bantering with her Dad again makes it good; that look on Todd’s face in panel six looks way more playful than any sort of annoyed to me. I just love her sly face. For the Snark *was* a Selkie you see. Actual last line from “The Hunting of the Snark” by Lewis Carroll: “For the Snark *was* a Boojum you see.” But this was also the first line he thought of. Then he wrote some lines to lead up to it, then some more verses, and eventually the whole poem. Which you should read, if you haven’t. It’s at least as weird and funny as you might be imagining. Selkie’s turning the scenario into a joke also eases the tension, as Amanda’s body language looks a tiny bit more open from the banter. If those two ever could get past the meanness and be decent to each other, they’d make a great team. Right, compare Amanda’s posture in Panel 3 (hunched over, both arms around herself) to Panel 6 (sitting up straighter, shoulders relaxed, letting go with one arm). She’s not comfortable yet, but she’s getting there. I wonder how Selkie will react when Amanda officially calls Todd her dad. I can see her throwing a fit after Amanda leaves and I can also see her shouting at Amanda that he’s, “not her dads” or possibly just getting really sad. Given Selkie’s personality, I see her more likely to get upset in anger than upset in sadness. I suppose the more passive remark would be her muttering about how he’s her dad and not Amanda’s dad. That’d work too I think. I’m pretty sure Selkie got over that part when she screamed in the car about Amanda being her sister. She seems mature enough to me to acknowledge that Amanda does, in fact, have just as much of a right to call Todd dad as she does. She clearly isn’t comfortable with Amanda being here, although she’s starting to tolerate it because Amanda isn’t being actively aggressive here. The moment Amanda starts cuddling up to Todd and he shows her parental affection, Selkie WILL be jealous. I mean, she’s a kid and it’s expected. Amanda very well might egg her on by giving puppy dog eyes and calling him daddy while shooting Selkie a dirty look. At that point Selkie would most assuredly explode in jealousy and shout something on accident. She’s a kid and she’s got flaws. Actually she gets defensive, angry and sarcastic just like Amanda does. They really are sisters heh. But really, we need to see Selkie do some ‘bad’ things in order to improve her character. No one is sunshine and rainbows or awesome all the time. We need to see her slip up and really seem like she’s just as capable of petty emotions like Amanda. Flaws, mistakes, and slip-ups, yes. This particular one, not necessarily. There’s certainly a level of mental juggling to be done, and I could definitely see the development of Selkie’s fear of being abandoned, which might take the form of a “he’s not your dad” or “he chose ME” but it doesn’t have to. But I’m with the others who think Selkie’s probably more mature about some of these things than you might take her for. And, she’s not operating from some of the fears Amanda has, because she never got accepted and then dumped — it just took her a long time to find someone who wanted her for HER, and that will mean a lot to her. It might be enough to assuage her fears of Todd abandoning her in the first place. Though I bet she’s also been thinking a lot about her mom. I think I lot of people over estimate her maturity because they think she’s so amazing and it’s not possible for her to do wrong because she’s the main character. I’m just waiting for her to do something that is undoubtedly in the wrong so she can finally solidify herself as someone very realistic to me. I’m a little confused – what’s the Cinderella grandparent connection? I thought in Cinderella it was STEPparents that were the problem. I wasn’t aware of any grandparent issue? Cinderella is probably very important to her as a story. Abusive parents that treated her like utter trash, ugly, and I use ugly in terms of their attitude, adopted brothers who assaulted her often. Todd & Co are probably her fairy godmother so to speak. But midnight has to come eventually and she wants to see what happens when the glass slipper drops. I think Amanda is asking if her grandparents are going to disappear like the dress, coach, etc., in Cinderella. It looks like once Amanda understands that she really can take these people at face value (Todd & her grandparents), and realizes that she truly does have a family – she’s going to fit right in. This family would make a wonderful case study. Snark: Nature vs. Nurture? BTW, her feet are like that because she’s doing a bowing curtsy.